Our Little One doesn't really like dummies but occasionally he needs one to help him fall asleep especially when he is in a pram or simply too tired. But the thing is that the dummy has a tendency to get lost in a large nappy bag when we out and about. No matter how many dummies we take with us, at least one will mysteriously disappear exactly when we need it. 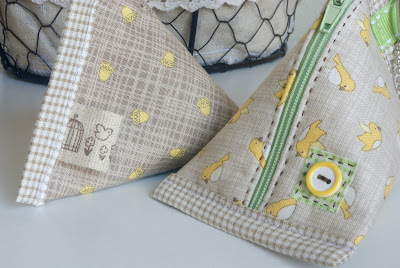 I remembered that a while ago I saw a cute pouch in a Japanese magazine called Cotton Time that I wanted to make. 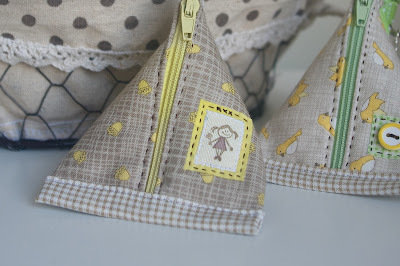 A triangular zipper pouch. So I made a couple. They are small but spacious enough to snugly fit one baby dummy and could be attached to the outside of a nappy bag with a small ball chain, so now we always know where our dummy is. I really like the shape of these pouches, they are constructed exactly as triangular milk cartons that we used to buy as kids. These cartons were a lot of fun. Grab one, chop the top off, sneak a freshly baked bread roll or a bun from the oven and you got a yummy snack on the go. 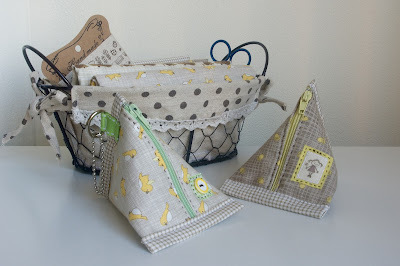 I really enjoyed working on these pouches - zips, ribbons, buttons, running stitches - nothing special or complicated. The pouches are about 10cm in size, I had to use 15cm long zips that I simply cut off at one end. 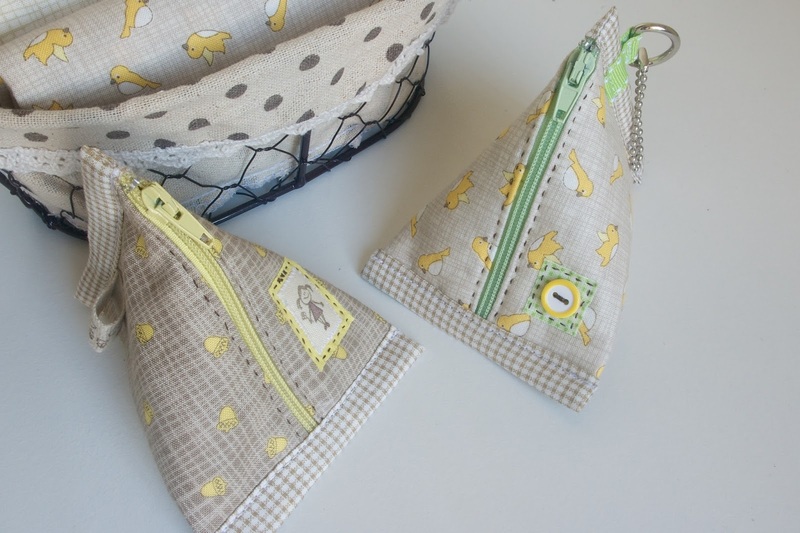 Pouches are great for storing small sewing items, coins, keys or whatever else you might think of. 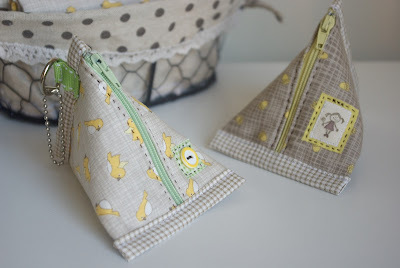 These pouches are truly easy and quick to make so you might find yourself making not just one but a few in a row. They make a wonderful small present on itself or a case for a small gift. Adorable pouches and a perfect solution to your dummy dilemma!!!! Thank you, Sharon! I love the fact that these pouches are quite different from any traditional shapes. It was fun making them.